After the rally in Assam's Moran, prime minister Narendra Modi is scheduled to address the second rally in Gohpur at 3 PM. Prime Minister Narendra Modi in Assam. Photo Credit: ANI. PM Modi also said, “They hate chowkidar, they’ve problem with chaiwalas too. I used to think it’s only one chaiwala on their target. 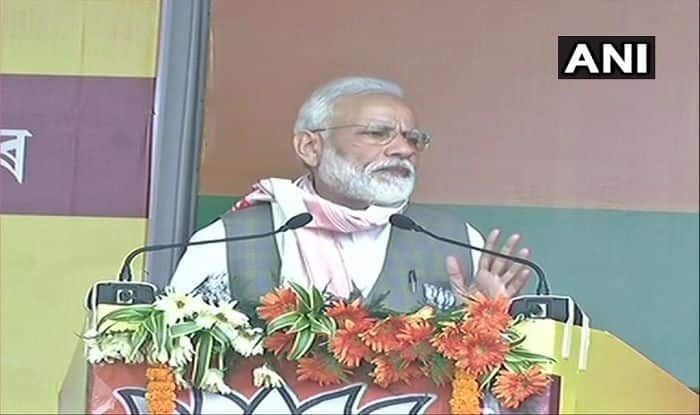 But when I visited all corners of the country, I realised be it WB or Assam, they don’t even like to look at someone associated with tea.” On Saturday, the Prime Minister asked the people of Arunachal Pradesh to vote for a ‘chowkidaar’ who would provide security to the country even as he attacked Opposition parties, saying they were “disheartened” by India’s growth and success. Kicking off his campaign in Arunachal for simultaneous Lok Sabha and Assembly polls the prime minister added that Arunachal is a “shield for the country with the people zealously guarding the border as sentinels”. Meanwhile, Modi is scheduled to address the second rally in Gohpur at 3 PM. In the 1st phase of general elections, polling would be held in 5 constituencies namely Kaliabor, Jorhat, Dibrugarh, Tezpur and Lakhimpur in Upper Assam. The counting of votes will be conducted on May 23.